This census data, along with the 1790 Clarendon County, Camden District Census transcription, has been donated to the Clarendon, Lee, and Sumter County, SC USGenWeb pages by Barbara Stacy Mathews. Barbara scanned her original typewritten copies which were then uploaded to the Sumter, SCGenWeb homepage. 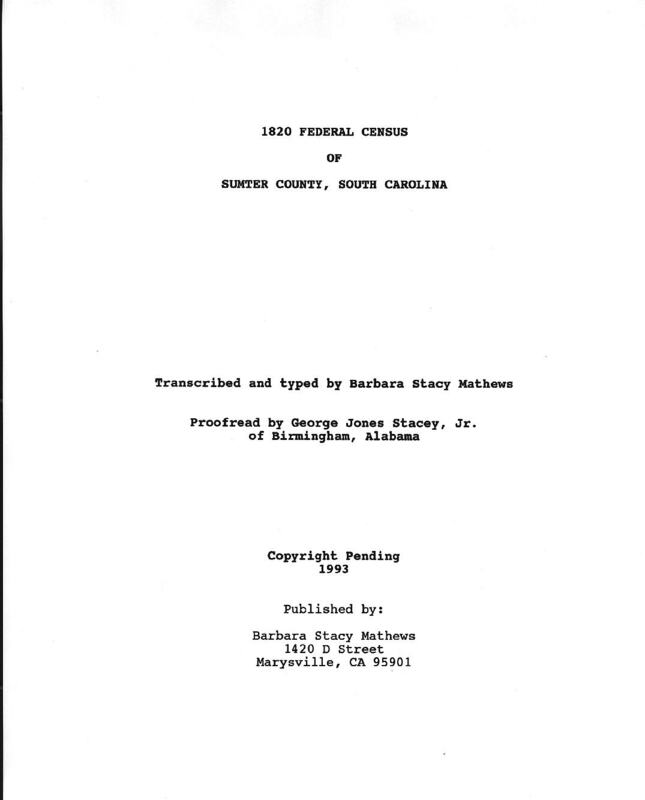 Lanny Cotton of Canton, Georgia offered to use his OCR software to change the scanned pages into faster loading text. I changed Lanny's text into html format, transcribed three of the pages that just wouldn't work when they were sent to him as graphics, and worked on getting the columns of numbers straight. Please send Barbara and Lanny your gracious thanks for all of their hard work. If there weren't folks like them who are willing to share and help me out, the Sumter, Clarendon, and Lee County Home Pages wouldn't be the success that they are. Researchers are free to copy and download this census to use for genealogical research of their own family lines. This information may not be published for profit in any form, nor may it be copied for any commercial purposes. Any copies that are made for the use of non-profit genealogical societies or archives must retain this disclaimer. Please remember that human errors do occur when transcriptions are done. If you see a name that you know is in error, please let me know. I will greatly appreciate it. You know the names of your ancestors better than Barbara, Lanny, or I do. It's always a good idea to use a transcription as a guide until you can see the microfilm page for yourself and make your own interpretation of the names listed here. One day in each census year has been designated as a census day. The official date for the 1820 Federal Census was August 7, 1820 (the first Monday in August). The enumeration began that day, and its report was to be correct as of that day. Each household was to include all persons living in the household on that day, reguardless of what day the census taker acutally visited. Person who died after census day, but before the census taker came were to be listed as still alive. Babies born after census day were to be omitted. Note: This name Bracy looks very much like the name Stacy. **** Robert Worrell wrote :"You have a transcription for a "Bryant Whissell?" shown on page 103 which I feel should actually be Bryant Worrell (my ancestor) who was born in Sumter County in 1790. Additional support would be the age of his wife and marriage date in 1813 which would give us one male 26-45 one female 26-45 and no children over 10. Census numbers agree with this showing 3 children under 10 (after 7 years married). Our family records confirm at least one son born in 1817 and suspicion of two older children (1 boy and one girl) names unknown."